WASHINGTON (AP) - The Obama administration launched a consolidated effort to spur new start-up businesses Monday, part of the White House's campaign to emphasize job creation while downplaying new economic spending initiatives that could face congressional opposition. 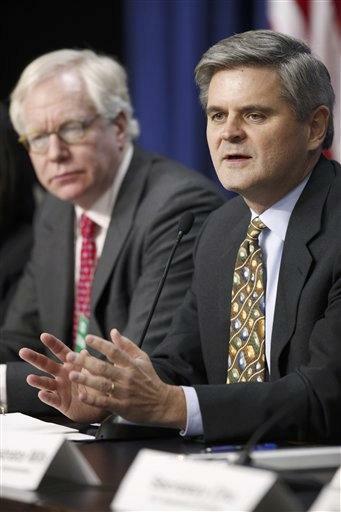 The new thrust will be led by AOL co-founder Steve Case, giving President Barack Obama's emphasis on the economy a second prominent business face in two weeks. Last week, the president named General Electric chief executive Jeff Immelt as head of a presidential advisory council on competitiveness. With unemployment stubbornly stuck above 9 percent, the White House has drafted a series of initiatives designed to put job creation efforts on display. Monday's announcement, labeled "Startup America" by the White House, focused on innovation and entrepreneurship and combined administration programs already underway with new ideas to leverage private-sector investment in start-up businesses. "Entrepreneurs embody the promise of America: the belief that if you have a good idea and are willing to work hard and see it through, you can succeed in this country," Obama said in a statement. "And in fulfilling this promise, entrepreneurs also play a critical role in expanding our economy and creating jobs." The administration launched the project with a high-profile White House event featuring scores of entrepreneurs, some of whom offered testimonials to the job creation possibilities that new businesses can bring to the economy. "We want to celebrate the work of entrepreneurs, shine a spotlight on entrepreneurs," Case said. The White House announced that Obama's new budget this month will propose permanent elimination of capital gains taxes on investments by small business. Congress passed a temporary version of that provision last year. The Small Business Administration also will redirect $2 billion in small business assistance and specifically target startup firms in underserved communities. And the Commerce Department will expand a program that helps market clean technologies. The White House did not provide an aggregate dollar figure for the new program. Officials have been highlighting the role of the business community in job creation - a recognition that any government spending initiative would face difficulties in the new Republican-controlled House. The office of House Speaker John Boehner was dismissive of the new launch. "It seems the only thing new being offered by the White House this morning is another catch phrase," Boehner spokesman Brendan Buck said. "Not until the administration is prepared to break down Washington barriers to job creation - onerous mandates, costly regulations, and economic uncertainty resulting from massive budget deficits - will we see renewed confidence from American small business owners." Other aspects of the White House program include partnerships with private sector and philanthropic groups to provide seed money and counseling to budding entrepreneurs. Officials said the effort had already resulted in $400 million in private sector commitments to help startup companies. "The more we are tearing down barriers, creating tax incentives, making lending and financing more possible for people with good ideas, the more we get the momentum from having the public, private and the nonprofit sector all pulling in the same direction," said Gene Sperling, the head of Obama's National Economic council. Obama has scheduled a trip Thursday to the Pennsylvania State University to promote his innovation agenda. Last week, Obama focused on free trade. White House officials say Obama will be embracing thematic approaches to job creation over the next few weeks. The attention to startups and greater innovation, however, is not likely to have an immediate impact on the unemployment rate. "It's a longer term payoff," said Mark Zandi, chief economist at Moody's Analytics. "To implement the program and generate new business formation and job creation will take years as opposed to months. It's a still a good idea, but I would not look for a big near term benefit."